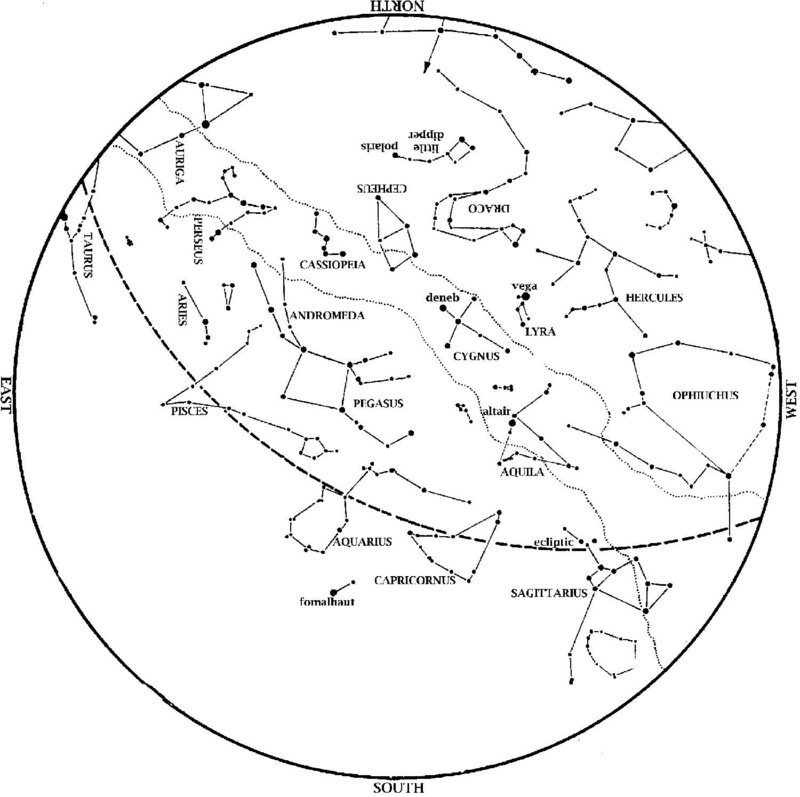 This star map shows the Houston sky at 8 pm CST on November 1, 6:30 pm CST on November 15, and dusk on November 30. To use the map, put the direction you are facing at the bottom. The Summer Triangle is high in the west. The ‘teapot’ of Sagittarius sets in the southwest. How long can you follow Saturn as it sets in twilight? The Great Square of Pegasus is high in the east at dusk. To the south and east, we see a vast dim area of stars known as the ‘Celestial Sea’, where only Fomalhaut stands out. Venus is a little higher in the evening sky this month. Look low in the west southwest in evening twilight. Venus pulls away from Saturn, having passed it late last month. Saturn gradually drops into the Sun’s glare this month. Visible to the right of Venus on November 1, Saturn sets earlier and earlier each night until it sets in twilight by Thanksgiving. You’ll need a clear horizon to the west southwest to find it. How long can you still see it? Jupiter is much higher in the morning sky this month. Look in the east southeast at dawn. Autumn represents sort of an ‘intermission’ in the sky, with bright summer stars setting at dusk, while bright winter patterns such as Orion won’t rise until later (Orion is up by about 10 now and about 9 mid-month). The Summer Triangle is in the west. Meanwhile, the Great Square of Pegasus is almost overhead. The stars in the southern sky are much dimmer than those overhead and in the west because when you face south at dusk in November, you face out of the Milky Way plane. The plane of our Galaxy follows a path from the Summer Triangle in the west through Cassiopeia in the north and over to the northeastern horizon. Constellations in the November southern sky are almost entirely devoid of bright stars. They represent beasts and gods related to water, indicating that they are part of the ‘Celestial Sea’. Examples are Aquarius, the Water Bearer and Pisces, the Fish. Even Capricornus, the Goat, has a fish tail because he’s originally Ea, Babylonian god of the waters. Below Aquarius is the one bright star in this area, Fomalhaut, marking the mouth of the Southern Fish. Ancient Mesopotamians imagined that the Persian Gulf extended upwards into the sky, joining this ‘sea’ of dim stars. All of these celestial happenings are on show every Saturday at our George Observatory. Located in Brazos Bend State Park, the seclusion provides a nice dark sky, perfect for viewing stars. Docents and Observatory staff are available to help new star gazers discover amazing extra-terrestrial wonders.